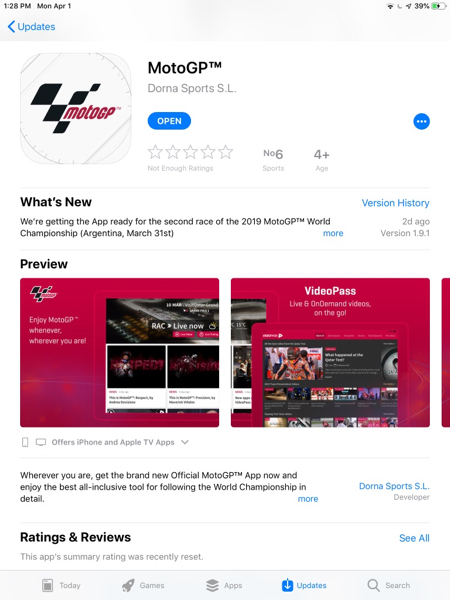 I have followed MotoGP for years and when Dorna began to provide live feeds I subscribed immediately, mostly using the browser on my iOS devices and watching on a larger screen using AppleTV. This year, an iOS app arrived, but it was not initially clear that this was available for AppleTV as well. It is significant that Apple is moving towards becoming a content distributor with its new TV service, although just how it will work, its availability worldwide and pricing are yet to be confirmed. I wrote on this at the weekend: Distribution is not a Charity. A number of content owners have seen the ways in which delivery conduits have changed over the years. A good example was Formula One Management under Bernie Eccleston who in the 1970s and 1980s saw how powerful television had become. The three-race MotoGP (Moto3, Moto2 and MotoGP) series is less caught up by any traditional approach and Dorna Sports S.L. has pushed content availability across a wide spectrum of delivery systems. Like Formula One, television played an important role in making races available to followers worldwide. Dorna recognized much earlier than F1 Management that the internet had an important role to play and reacted to the new delivery methods. Dorna set up online access to its archive of races and other sessions (testing, releases) and also provided live feeds: testing, qualifying and the races. Before, I had watched races only on a cable feed, but with the times of some events (such as those in the Americas) I would rely on repeats, some of which were removed from the schedules by the cable TV provider. With the Dorna service, I was able to sleep at a respectable time and replay the races I had missed at a time convenient to me. When Netflix arrived here, I switched most of my viewing to that service with its good content and times convenient to me. 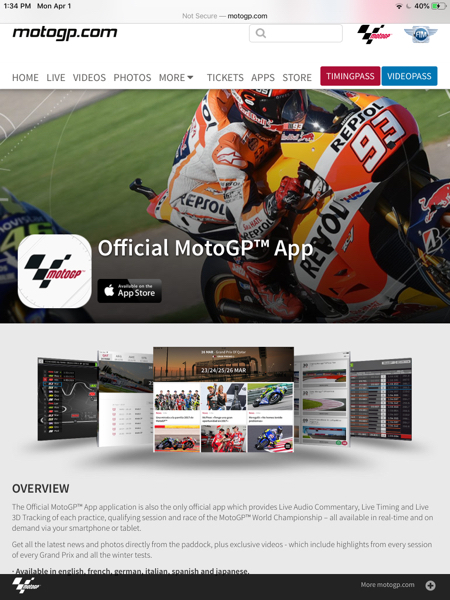 As I had already begun to use the Dorna subscription. This year I paid €139.99 (November to November). The in-app purchase for the app shows $125 (4400 baht): a reduced period. I had been paying the cable company a lot of money each month, but with Netflix and the MotoGP subscription, was only using the service for around 20 Formula One races; and that was only for part of the year. I cancelled the subscription and followed F1 for a while using the timing app and the radio feed. It was that, constantly interrupted by gaps as the BBC-sourced commentary switched to other sports (soccer, tennis) leaving silence in its stead, that caused me to cancel that app too. The only commentators who seem to understand Formula One these days are Martin Brundle and David Croft (Fox Sports). Part of the package with Dorna, both for TV feeds and internet access include their own teams of experienced commentators. Several languages are available, and the English team have excellent insights. All have a wealth of experience (like Brundle and Croft). Following a race with first rate input from these commentators takes the whole experience to a different level. One of the problems I had experienced early on with the Dorna feed on the Mac was the use of Flash. That had long been banned from my Macs,. The problem was solved for me by viewing on iPad or iPhone. This was enhanced by the ability to feed the content to my large screen television, using the AppleTV and Airplay. There might be occasional feed problems, but little I had not experienced from the cable experience. I did contact the developer a year or so ago and asked about the use of HTML 5 as Flash was less and less used at that time. I was told they were experimenting with this and suggested I try a link. Although this was successful, I decided to stick with iOS devices as I had these set up as I wanted. Last year, Formula One Management announced that they were to provide internet feeds of the content, but when it came to signup time, I found that Thailand was one of the countries excluded: the local cable service held the monopoly. I reminded myself that they had already lost HBO and remained patient. 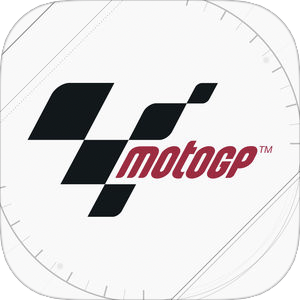 At the beginning of the 2019 MotoGP season, MotoGP released its own iOS app and I downloaded this as soon as I saw that it was available. However, my delight was short-lived. I was able to view video on the iPad and iPhone: Library clips and live feeds. When I tried to connect to the AppleTV and display content (mirroring) on the large screen I had no success. I initially thought this could be a problem either due to the newness of the app or because this was the first race of the season. I quickly switched to the browser and enjoyed the races. When the app was updated three weeks later in time for the Argentine Grand Prix I again tried with Apple TV. Alas all I saw was a grey panel or a still of the clip along with a sound feed. AppleTV is relatively poor here, with few apps available and no Siri. My main uses are Netflix, music, Apple movies (limited in comparison with other countries), and feeding content from my devices (Mac and iOS). As I had seen there was an update to the TV app on my iPad this week as well as watchOS and some beta updates, I had a look at the settings: tvOS 12.2 was available. I then had a rare look at the App Store. For some reason, Search would not load, so I tried the section for Purchased apps. I was surprised to see a MotoGP icon: white on black, rather than the normal red and black on white. 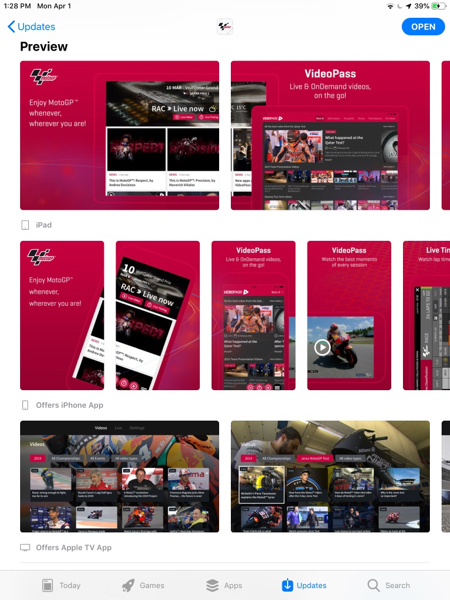 I downloaded this and once logged in, I had access to all of the content, including the clips and live feed. This must be one of the best kept open secrets in the App Store. To see how I had missed this, on the iPad I went back to the App Store and looked at the app description. 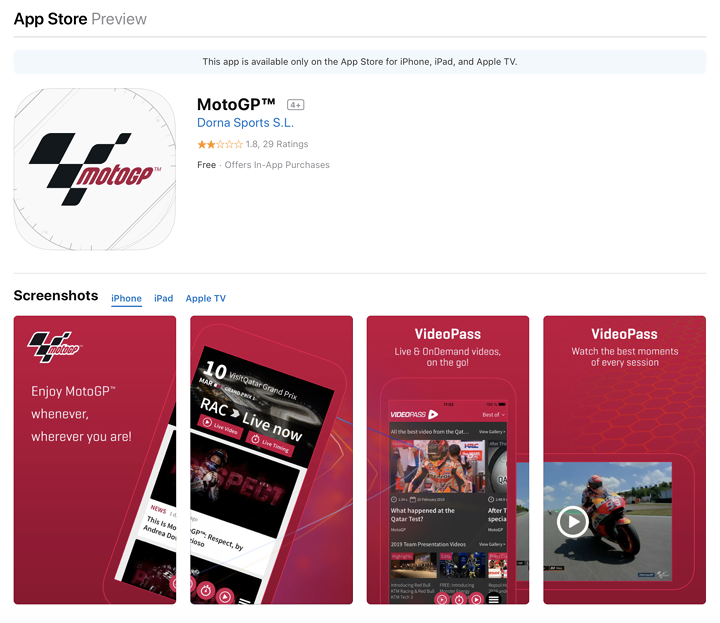 There is nothing about the TV app in the several paragraphs of content, although just below the preview images there is a caption, "Offers iPhone and AppleTV apps" - hidden in plain sight. Tapping the caption opens this up to display image previews for all three delivery types. The app is really good on the handheld devices, although I was initially confused by my inability to connect via screen mirroring. Having now accessed the TV app, I am wondering why the developers are not shouting about this from the rooftops.